In today's day & age, the Internet no doubt is a very effective medium in which advertisers can put their messages across. Well, one way to look at it would be to associate them with flyers and banners that use to fly across the streets in the olden times. In this day and age, Banner Advertisements are placed onto Websites just like Billboards are placed along roadsides & highways. In the massive network & routes linked within our site that forms part of the Information Superhighway, Banner Advertisements are placed onto WebPages that span across our site. Such advertisements can be both static or consist of interestingly catchy animated slogans, logos or pictures. If you have surfed around our Portal, you would have noticed the Webportal.com.my currently holds wide array of Interests & Topics available to our visitors. That is how we attract all new surfers to join as a member and also our members keep on coming back for more. Webportal.com.my can be considered a starting point on the net. Most members start off their surfing experience by logging onto Webportal.com.my as we are thought of to be a one-stop shop on the net where users are able to obtain any information they need from us. Apart from that we also have many other interesting sections (e.g. Free SMS, Matchmaking, Games & etc.) to keep our visitors happy. Since re-launching in Mid-March 2001 with our new & improved look, there has been exponential growth of visitors to our portal. As you can see from our visitor & member Demographics, all sorts of age groups throughout the nation can be reached by advertising on Webportal.com.my! 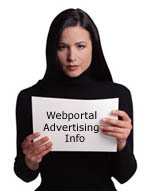 Additionally, the diversity in the demographic range of Webportal.com.my subscribers also means that advertisers can tailor their advertising messages to whichever segments they wish. All the above combined with Webportal.com.my's highly competitive & affordable advertising rates makes it a truly choice site in terms of cost-effectiveness.